Thank you for choosing Bright Health Training. Please read these Terms. By using Bright Health Training or signing up for an account, you’re agreeing to these Terms. This is a legal agreement. Here is some information including definitions that should assist you in understanding this agreement. Bright Health Training (“Bright Health Training” or the “Service”) is an online provider of short courses for professionals in the health and fitness industry. The service is offered through the URL BrightHealthTraining.com.au (referred to as the “Website”) that allows you to access short courses for health and fitness professionals (each course is comprised of a number of topics and lessons). Bright Health Training is owned and operated by Bright Natural Health, a partnership registered in Australia. (“Bright Health Training,” “we,” or “us”). Bright Health Training has employees, independent contractors, and representatives (“our Team”). As a customer of the Service, you’re a “Member” according to this agreement (or “you”). By using Bright Health Training, you represent and warrant that you meet all the requirements listed above, and that you won’t use Bright Health Training in a way that violates any laws or regulations. Bright Health Training may refuse service, close accounts of any users, and change eligibility requirements at any time. The Term begins when you sign up for Bright Health Training and continues as long as you use the Service. Clicking the button and entering your username means that you’ve officially “signed” the Terms. If you sign up for Bright Health Training on behalf of a company or other entity, you represent and warrant that you have the authority to accept these Terms on their behalf. You or Bright Health Training may terminate this Agreement at any time and for any reason by giving Notice to the other party. We may suspend our Service to you at any time, with or without cause. If we terminate your account without cause, we’ll refund a prorated portion of your course payment if your purchase date is less than fourteen (14) days before the date of termination. We won’t refund or reimburse you if there’s cause, like a violation of these Terms or our Acceptable Use Policy. Once terminated, we may permanently delete your account and all the data associated with it, including your comments or any uploaded artwork/images from our Website. If you don’t log in to your account for twelve (12) or more months, we may treat your account as “inactive” and permanently delete the account and all the data associated with it. Accounts are for individual use and may not be accessed by anyone other you the member. Access to courses is gained after successful payment processing via our payment gateway/s. We use PayPal as our payment gateway to process credit card transactions. As such we don’t have access to or hold credit card details in our database. You will be entitled to a refund from us under the following terms of our ‘No Risk Guarantee’. 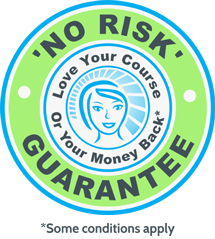 If you are not satisfied with the quality of a course you have purchased, you may request a refund. Refunds for the purchase amount will be give if you advise us of your dissatisfaction within 3 days of the purchase date for the course. As we don’t keep credit card details in our database, you will be required to provide us with bank details or credit card details to make the refund deposit into. You shall respect our proprietary rights in the Website and the software used to provide Bright Health Training (proprietary rights include patents, trademarks, service marks, and copyrights). Our content (text, audio/video recordings and images) is protected by copyright and you may not make copies or distribute this content without our written consent. You access our Content as an individual and will not use our content as part of any commercial activity of your own. You won’t on-sell our Content. You won’t distribute our Content, other than through avenues provided by the Service, such as social media sharing. To the maximum extent permitted by law, you assume full responsibility for any loss that results from your use of the Website and the Services, including any downloads from the Website or 3rd party content distribution service. We and our Team won’t be liable for any indirect, punitive, special, or consequential damages under any circumstances, even if they’re based on negligence or we’ve been advised of the possibility of those damages. Our total liability for all claims made about the Service in any month will be no more than what you paid us for the course/s. You agree to indemnify and hold us and our Team harmless from any losses (including legal fees) that result from any claims you make that aren’t allowed under these Terms due to a “Limitation of Liability” or other provision. You also agree to indemnify and hold us harmless from any losses (including legal fees) that result from third-party claims that you or someone using your password did something that, if true, would violate any of these Terms. If we file an action against you claiming you breached these Terms and we prevail, we’re entitled to recover reasonable legal fees and any damages or other relief we may be awarded. You, the participant, acknowledge that the courses offered by Bright Health Training provide preliminary knowledge and skills and are not intended to form the basis of professional practice. Bright Health Training website has been optimised for viewing in Chrome (v27 and above). Although we test for compatibility with other browsers, If you are running any other browser or browser versions, you may encounter problems with certain sections of the website. The site (excluding any linked third party sites) is controlled by Bright Natural Training. By accessing this site, you accept that any disputes about this site or the Content are to be determined by the courts having jurisdiction in Queensland, Australia in accordance with the laws in force in Queensland, Australia (subject to the application of any principle of conflict of laws inconsistent with this requirement). This site may be accessed throughout Australia and overseas. Bright Natural Health makes no representation that the content of this site complies with the laws (including intellectual property laws) of any country outside Australia. If you access this site from outside Australia, you do so on your own responsibility and are responsible for ensuring compliance with all laws in the place where you are located. We can’t change these Terms for any one Member. So no changes, no exceptions. Thanks for taking the time to learn about Bright Health Training’s policies.